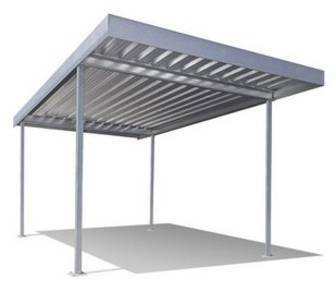 The Stratco Frontier is a simple, well designed, freestanding carport, verandah and patio system. It is economical, and excellent value for money. The Stratco Frontier system is the ideal do it yourself project. Delivered as a complete package with clear, concise instructions, and all components needed to finish the job. Shield your car from the elements or expand your outdoor living and storage possibilities. Not only will the Stratco Frontier’s heavy duty roof sheeting keep your car cool all year round, but it will give yousafe, secure cover from even the largest hail stones and bad weather. The durable Stratco Frontier is a lasting investment. The frame is constructed with strong, galvanised c-section beams, and the roofing is manufactured from high quality zinc-aluminium. The Stratco Frontier carport, verandah and patio system is locally manufactured to strict standards. Designed to suit local specifications, Stratco can provide a complete set of engineering specifications for quick council approval.